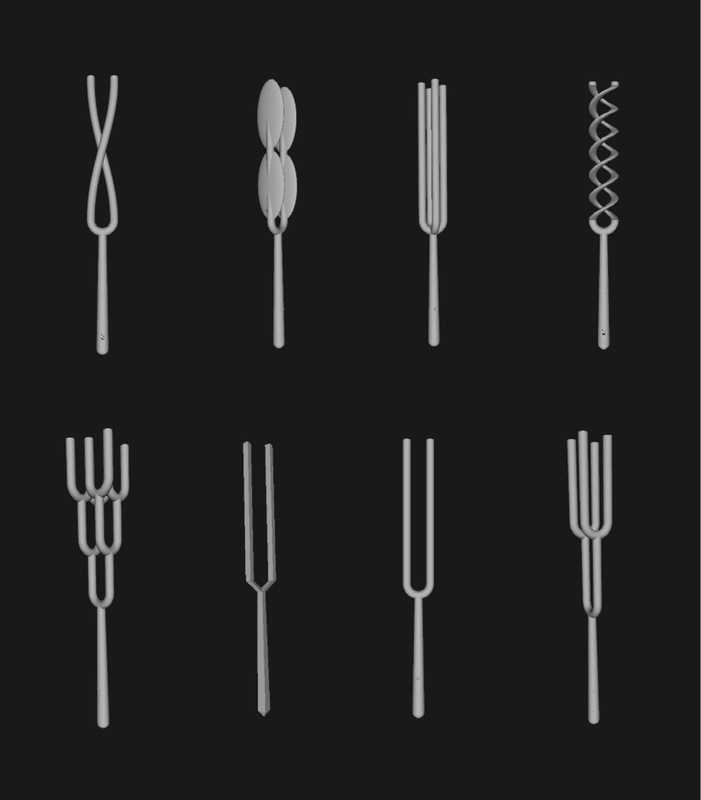 The tuning fork rules the orchestra through its precisely repeatable production of a tone at a specific frequency. The shape is designed to produce a simple tone, and slow-motion video shows how the two-pronged arrangement amplifies the primary mode of vibration while damping other more complex twisting and flexing modes. The variations on the tuning fork in this exhibition reconfigure the arrangement of the prongs to allow unruly vibrations. Could an unruly tuning fork sound interesting enough to join the orchestra too? The exploration of the space of variations is facilitated by Computer Aided Design and 3D printing. These Tuning Forks are part of the Unruly Orchestrations exhibition at Belconnen Arts Centre in Canberra from 13-29 June 2014.